I’m 22 years old, I weigh 58 kg and my height is 5’8”. I’ve recently joined a gym with the intention of building muscles. Is it possible to do that within six months? Please suggest a diet that goes along with my workout regime. I cannot afford costly products. Diet: Breakfast: One glass of milk + 1 tsp sugar + 1 scoop of Protinex + 2-3 egg white omelettes + 2 chapatis/ 3 slices of whole wheat bread. Evening Snacks: Chikoo milkshake/ lassi + 1 plate of potato poha/ 2 tomato omelettes with green chutney. Dinner: 2 chapatis + 1 cup of rice + fish curry/ 3-4 pieces of chicken + 1 cup of vegetables + salad. Bed time: Fruits with custard. I’m a 17-year-old boy and have excess fat around my chest. I walk on the treadmill at the speed of 5.5 km/hour for 20-25 minutes and do 15-20 crunches daily. I’ve been doing this for the past month and have found satisfactory results, but is this enough? Being in class XII, I can only devote about one hour for exercise every day. Also, please tell me what foods/fruits are good for my skin; I have a fair complexion but my neck and face are dark. The condition where males develop large mammary glands during puberty is called gynaecomastia. It is mainly caused by a hormonal imbalance, or medication with oestrogen or steroidal compounds. 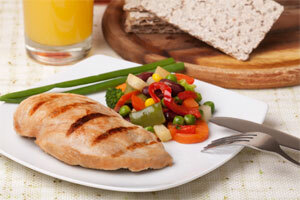 A well-balanced diet will help you to come down to your ideal body weight. Diet: Breakfast: 1 glass of skimmed milk + 2-3 tsp of Protinex + 2 dal dosas + 2 or 3 idlis with sambar. Mid-morning: Slices of apple/ pear/ papaya. Lunch: 1 bowl of salad + 3 dry phulkas + 1 bowl of dal + 1 cup of vegetables + 1 glass of thin buttermilk. Evening: One fruit + 1 whole wheat sandwich/ sprouted bhel. Mid evening: One bowl of mixed vegetable soup. Dinner: Two small jowar rotis + 1 cup of vegetables + 3-4 pieces of chicken (either grilled/ roasted)+ 1 cup of raita. Bed time: 1 cup of skimmed milk (without sugar).